Out with family for a crabby feast! This was one of my favourite dish. I like anything with rubbery texture, such as abalone & squid. This dish looked simple with just some sauce and chopped garlic, but it tasted heavenly. 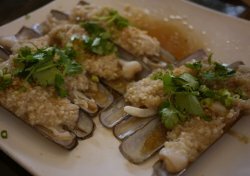 The garlic definitely played a major role in bringing out the aroma, and yet covering any "fishy" smell of the seafood. I dun like to eat garlic, but dishes cooked with garlic are good! You should try it! There were 7 of us, so we ordered 2 crabs cooked in different style. 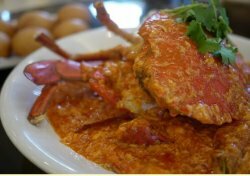 The Chilli Crab was a must order. I particularly adored the gravy even though I dun take spicy food. The eggs in the gravy sure helped to mellow the spiciness a bit, so that I just need to gulp down one glass of iced water instead of one jug. Hahaha..
One thing I like about Long Beach crabs ~ They were super meaty! And I love to eat the fried Man Tuo 馒头 with the gravy. Yummy! 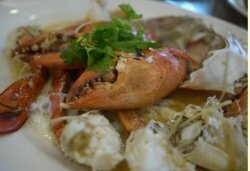 On the contrary, the White Pepper Crab was quite blend. It was recommended by the waiter lor! Humpt, bad recommendation. I should have ordered crab with century egg!